Tell Us What You Copy - And Support New British Music! If your school is covered by the Schools Printed Music Licence, we want you to tell us what printed sheet music you copy in your school. When you tell us what you copy we will use that information to pay publishers who invest in new songwriters and composers. The royalties that publishers, creators and artists are paid means that they can receive a fair payment when their works are copied. This money means publishers can invest in the creation of new music and writers can keep producing the music that we all use and enjoy. There are two ways you can tell us what you copy. Either through participation in our 'Data Collection Exercises' where we visit your school and arrange to collect information about what you copy over a particular sample period; or, if you're not taking part in one of these exercises then you can tell us what you copy at any time by using the Tell Us What You Copy Form on our website, below. Here's a bit more about how these methods work. 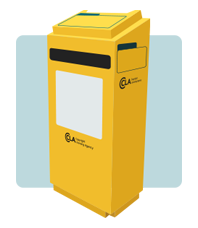 If your school is taking part in a Data Collection Exercise, we will have contacted you to set up yellow boxes in an appropriate department or classroom, usually next to a photocopier, with labels for you to attach to the copies you place in the yellow box. There are instructions on the box showing you what to do but if we ask you to take part you will be fully briefed at that time. Below are some general notes on reporting copying of printed music. We have designed a simple form that you can complete to tell us the title, publication details and amounts of the sheet music you copied. The form can be completed electronically but you will need to download it and then email it to us so we can use the data to allocate royalties to the publisher. If you don't have the ISBN for the publication you copied, please take a photo or make a scan of the front cover and first page and attach it to the email along with the form. Complete the Tell Us What You Copy form online. If you would like to request a FREE pack, please email: TellUsWhatYouCopy@cla.co.uk or call us on 020 7400 3187. Thank you for telling us what you copied! Unsure if your school is covered by the Schools Printed Music Licence? Or just want some more information on what the licence lets you do? See our main SPML page for more. 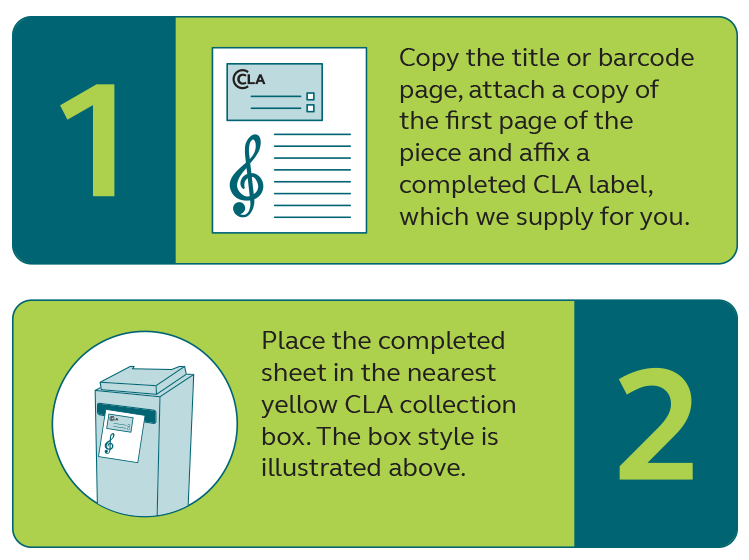 Your Schools Printed Music Licence lets you use printed sheet music freely. You can make as many copies as you need as well as new arrangements of all types of music of every genre. See how it works and what is covered. We send emails from time-to-time containing news about the Schools Printed Music Licence, music competitions or related events. If you would like to receive these, please follow this link to subscribe.